By August 1, 1937, the total number of CCC camps had gone down to 2,029 and a year later to only 1,623. The National Park Service had gone back to a four-region setup with 83 national park camps and 337 state park camps. Director Arno B. Cammerer had made his move in January to regionalize the National Park Service, effective August 1. Arno B. Cammerer, director of the National Park Service from August 10, 1933, to August 9, 1940. The service was regionalized under his leadership. The eastern region, Region I, had offices in Richmond, Virginia, and Dr. Carl P. Russell was its director. Russell had many years of service as an administrator and naturalist in the field as well as in the Washington office. Region II included the states of the northern Midwest. Its headquarters were in Omaha, Nebraska, and Thomas J. Allen served as regional director. Allen was a Mather man whose experience went a long way back. He started as a ranger and advanced through all the steps, including assignments as superintendent of Bryce Canyon, Hawaii Volcanoes, Hot Springs, and Rocky Mountain national parks. Region III included Arizona, New Mexico, Texas, Oklahoma, and Arkansas, with the regional office in Santa Fe. 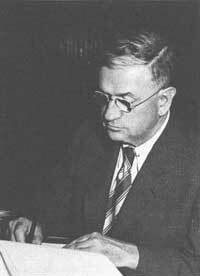 Herbert Maier, the regional director during the CCC program, was made acting regional director. Maier had been with the service from the beginning of the CCC program. He was an excellent architect and exerted a strong influence on the style of park architecture that still persists. The first Region III director was Assistant Director Hillory Tolson of the Washington Office, who took up the assignment on May 1, 1939. It was Secretary Ickes' idea to send Hillory Tolson to Santa Fe. He also suggested that I be sent to Yellowstone as superintendent for a year, but then I got word that my move had been called off. E. K. Burlew, assistant to the secretary, asked that I not be reassigned because it would be difficult to get somebody to handle the emergency programs in which I had become so deeply involved. Instead, they made me the secretary's representative on the CCC Advisory Council in place of Director Cammerer. Region IV included California, Oregon, Washington, Idaho, Nevada, and Utah. Chief Engineer Frank A. Kittredge was regional director with offices in San Francisco. The members of Kittredge's engineer staff were moved to the regional offices and to Tom Vint's new office, the Branch of Plans and Design. This move put engineers, architects, and landscape architects all in one organization. The year 1937 was one of the roughest years of the CCC as far as I personally was concerned. Although we got a great deal of satisfaction and pleasure out of the CCC because it was such a good program, there were difficult timestimes of disappointment, times of concern, times when one wished to have a little more opportunity for meditation. My new designation as the secretary's representative on the CCC Advisory Council didn't really change my activities very much. I had already gone through a consolidation of the national park and the state park CCC. I had been attending all the council meetings, and practically all of Coffman's responsibilities had already been turned over to me and my staff. I had been in direct contact with E. K. Burlew and Mrs. J. Atwood Maulding, who were Secretary Harold Ickes' closest working associates. Practically everything was known to them, and they took on a lot of hard work. 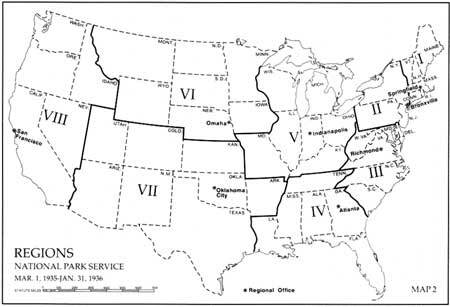 With the beginning of the Civilian Conservation Corps, the National Park Service established four district offices to administer the state park CCC program, as shown on Map 1. At that time there were 100 camps assigned to this work. By 1935 the number of camps assigned to state and metropolitan parks had reached 475. Under the Park, Parkway, and Recreational-Area Study Act of 1936, federal aid to the states for planning park and recreation activities and to certain federal agencies for similar purposes was greatly increased. The districts were increased to eight and were redesignated regions (Map 2). 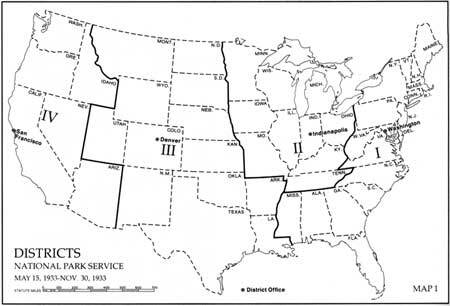 By July 1, 1937, the camps administered by the National Park Service had decreased to 325 as the CCC program began to taper off At that time the National Park Service as a whole was regionalized in four areas, as shown on Map 3. But nobody in the department worked any harder than did Secretary Ickes himself. He practically lived in his office, a circumstance that more than likely had something to do with the planning of the secretary's suite in the present Department of the Interior Building. The construction of a new Interior Building was one of the early projects he authorized as administrator of the Public Works Administration, a position he held simultaneously with his service as secretary of the interior. Although the National Park Service, which then was responsible for all public buildings in Washington, was in charge of this project, the secretary kept close watch over the planning and actual construction. One of the rooms in the secretary's suite in the new building was equipped with furniture that could be converted to bedroom use, and adjoining it was a bathroom complete with tub and shower. Nearby was the official dining room. There was quite a bit to do about all this in the newspapers at the time, but I know Ickes spent many nights in his office working very late, and I have no doubt that he often slept there, because his home was several miles away in the vicinity of Olney, Maryland. 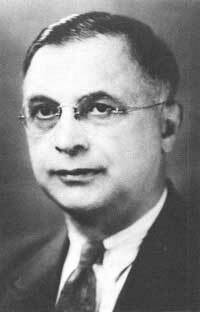 Harold L. Ickes was secretary of the interior from 1933 to 1945longer than any other head of the department. Ickes served as secretary under Presidents Roosevelt and Truman for twelve consecutive years, which I believe is a record for a secretary of the interior and possibly for secretary of any federal department. He wasn't a person one could get very close to, yet he was a hard worker who believed thoroughly in what the Park Service was doing, and he had the reputation of being a strong conservationist. I didn't have much contact with him when he first came to office and Horace Albright was director. But as I became involved with the CCC, and particularly after I was designated Ickes's representative on the CCC Advisory Council in 1937, I got to know the secretary well. He was a gruff sort of a person, but I enjoyed working for him very much. He was unequivocal in his instructions and could be depended upon to back up an employee who got in trouble carrying out his orders. One case in point was an embezzlement in the CCC, concerning a camp that never existed. Bob Jennings was the head of our fiscal division, handling both regular appropriations and CCC allotments. One day the army finance officer telephoned and asked for one of Jennings' men. Jennings informed him that the man was on sick leave. The finance officer then wanted to know who was going to pick up the payroll. Jennings was startled but quickly said, "Well, I'll come down and get it very shortly." The finance officer gave him the copies of the receipted payroll together with the salary checks. This procedure was irregular, but Jennings accepted them and returned to his office. The standard procedure for handling the payroll for the camps was for the superintendent to send it to the army finance officer, who would check it over, make out the checks, send them directly to the individuals through the mail, mark the payroll "paid," and send one copy of it to the superintendent and another copy to the office of the bureau that had jurisdiction over the camp. In this case there was no camp. The man in Jennings' office was taking the checks, forging the payee endorsements, and getting them cashed at stores and banks in Washington. Jennings reported the embezzlement to me immediately. He found that it had been going on for over a year. In order to maintain a semblance of authenticity, the man had actually "fired" certain foremen, "hired" additional ones, given promotions, and relocated the fictitious camp. Just as this matter was being checked into, one of the ambitious young clerks in our fiscal office managed to slip upstairs to the secretary's investigation division and give them an oral report of what was happening down in the Park Service. The investigators immediately informed the secretary, and I got a telephone summons to the secretary's office. When I went into his office, Ickes was working at his desk, coat off as usual, shirt sleeves rolled up, and without looking up he said, "You are in charge of the CCC program, aren't you?" I said, "Yes." He then said that he understood there had been a payroll issued for a camp that never existed. I said, "Yes, we've just discovered the embezzlement, we're getting all the details and our report will be up very shortly." He said, "Well, then, it actually happened?" And I said, "Yes." He said, "You are in charge." And I replied, "Yes." He said, "Well you're through as of now." There was little I could do. I turned around, walked out, and returned to our office. The director was not there, and so I reported the incident to Arthur Demaray, the associate director. He knew that our investigation was in progress and told me to go back to my office and act as though nothing had happened. He said everything would be straightened out. I tried to keep busy, but naturally I was disturbed. About three days later I was called back to the secretary's office. I tried to get hold of Demaray to accompany me, but he was not in the building and so I went alone. The secretary was in the same positioncoat off, sleeves rolled upand, again without looking up, he said he thought that I was carrying too much work. I replied that I was doing only the jobs that he and the director of the Park Service had assigned to me. He talked a little more, never looking up, and finally said, "Well, I'll have to see what I can do to shift some of your work load." I waited a few minutes, nothing more was said, and so I turned around and walked out. He said nothing about having fired me three days before, and I certainly saw no reason why I should bring it up. A month later I received written notice assigning me additional duties and responsibilities. Secretary Ickes did seem to have a penchant for premature judgments, as illustrated by my sudden firing and also by the following letters. Your memorandum of January 18 sent to Mr. Blossom has been brought to my attention. I regret that your action in serving notices of separation on five employees in the Recreational Branch of your office is cause for reprimand. You are fully informed of personnel procedure and your explanation that the action you took conformed to procedure in effect in the State Park Emergency Conservation Work and in other emergency activities for at least several years is untrue. This is another example of the unsatisfactory handling of personnel matters in the activities under your supervision and, unless marked improvement is shown immediately, it will be necessary to reorganize your office and separate from the service the offending employees. It is with sincere regret that I acknowledge your letter of reprimand dated January 25. To the best of my ability, I have devoted my entire efforts to the carrying out of what I honestly believe to be your wishes and policies. The most disturbing part of the reprimand is the reference to my memorandum as being untrue. I am not given to falsifying nor would I knowingly permit any one in an organization, which I might be given to manage, to be untruthful. If my statement is untrue, may I assure you it is due to misunderstanding, and I respectfully request that other members of the National Park Service dealing with personnel be questioned as to their understanding of that particular part of the personnel procedure which I have violated. With reference to the handling of personnel matters in the activities under my supervision, definite steps have been undertaken to correct this situation. By the time the entire Park Service is together in one building, all personnel procedure will be handled through the regular national park personnel division, and my office will retain only administrative matters such as selections, organization, etc. I sincerely hope that my future efforts will prove to be satisfactory and that you will be convinced that my foregoing statements are my honest convictions. I do not intend this as a criticism of Secretary Ickes, for this was not the only time I got fired or reprimanded. Other letters by other secretaries will appear in later pages. I have never failed to answer such letters, but my answers have never been acknowledged. While this silence leads me to believe that my answers were found to be correct and that the secretaries were willing to let the record rest, I believe they should have acknowledged my replies. Again I emphasize that my direct contacts with Secretary Ickes were very rewarding, and I have a very deep feeling of gratitude for the support, understanding, and backing of Secretary Ickes, Director Cammerer, Associate Director Demaray, Senior Assistant to the Secretary Burlew, and his very efficient and understanding assistant, Mrs. Maulding. In the same vein I must also relate an incident, concerning a silver bowl, that grew out of a simple park dedication ceremony in Virginia. Will Carson, who had the big house on the hill in the relatively small town of Riverton near Front Royal at the north entrance of Shenandoah National Park, was conservation commissioner of the state of Virginia in the early CCC days and held the office until the state made it a salaried job in the late thirties. The Carsons lost their only son in the First World War, and in memory of this boy they had given to Riverton some forty acres of land along the Shenandoah River for a park. The town of Riverton applied for a spike camp of forty CCC boys for one year to develop park facilities for the community and offered to pay for all materials. This was a normal request and well within the regulations; we had undertaken such projects many times in other places throughout the country. This spike camp came from a CCC camp some fifteen miles away, in Shenandoah National Park. After the job was completed the local committee decided to have a dedication as an expression of thanks to the Carsons. They invited Mrs. Wirth and me and asked me to say a few words. I spoke for about five minutes along with four or five local people. Then Will Carson got up and responded, and at the end of his talk he turned, picked up a package, and presented it to me. In it was a good-sized, engraved Paul Revere silver bowl. I knew I should not accept it, but it would have been terrible to refuse at that momentso I thanked them. The next day I sent a memo to the director telling him what had happened and asking for instructions on what to do. Cammerer sent my memo to the secretary, recommending that I be allowed to keep the gift. In about two days word came back telling me to return it. I wrote the Riverton committee that I was not allowed to keep the gift and asked whether I should send it to them or return it to the store in Washington where they had bought it. About two weeks later Will Carson called to say that the committee was undecided just how to handle the matter, that they didn't want to embarrass me any further, and that if it was agreeable with Mrs. Wirth they would appreciate it if she would hold the bowl for them until they worked the matter out. I reported this development to Director Cammerer, and he sent my memo on to the secretary, who approved it. A few days later I received the following letter from Will Carson. A copy of this letter was sent to the secretary, without eliciting any comment. Helen is still holding the bowl for the Riverton citizens. This is to own your letter in which you advise me that due to a ruling in the U.S. Code, Section 66, Title 5, you had to return the silver bowl that was presented to you by the citizens of this community. Of course we had no information of the ruling and are sorry that we put you in such an embarrassing position. However, you will realize that the presentation of the bowl by the citizens of this community was made out of the fullness of feeling of the good work you had done, and was a way to acknowledge to you and to the Department our gratitude. This letter also acknowledges the return of the bowl. As the silver-bowl incident showed, things often happen when they are least expected to; "Chic-Chat" provided another of those happenings. At the CCC camp in Chickamauga and Chattanooga National Military Park in Georgia and Tennessee, there was a disagreement over the location of a park entrance road. The argument was between the superintendent and our technical people, but the local community took sides. It began to be a hot issue, and no plan could be approved. Finally, Director Cammerer asked me to go there to try to arrange a solution. I indicated to Cammerer that I would be glad to go but would like to have the authority to make a decision on the spot and get construction under way at once. This he readily gave me. When I arrived representatives of the state highway department, our park superintendent, and our technical people were all present, and we spent a whole morning examining plans and going over the proposed locations in the field. Finally, I reached a decision and told them that we would start construction that afternoon. I asked the superintendent to get in touch with the mayor in the nearby community and announce that we were going to have a brief ground-breaking ceremony at three o'clock that afternoon. Then I told the CCC camp superintendent to have two or three trucks and some twenty or thirty CCC boys there with shovels so we could break ground.